The records of the poll go back to early March. Back then the leader was Mike Huckabee with, who had the second highest recognition score at 87%, and the highest intensity at +25. The intensity rating is the same popularized by Rasmussen Reports: the difference between strongly favorable and strongly unfavorable rating scores. But as we see from the chart (click to blow it up), the candidate who’s led most of the way in positive intensity is Herman Cain. Herman Cain always looked to have benefited from the self-destructions of Michele Bachmann and Rick Perry in the debates, and that’s clearly true. However we see that he was actually well-liked by those who knew him since before he led in the national preference polling. Newt Gingrich though, his chart is unlike any of the others. Bachmann, Perry, and Cain all started high and dropped off rapidly after their introductions to national audiences. Mitt Romney started in the middle but has seen a slow decline in recent weeks. Newt Gingrich however started in the middle, fell apart, but has gradually rebuilt his image, I believe through his debate appearances. He’s consistently been rated as a great debater, even by those who dislike his candidacy. Believe it or not, we may be faced with a situation where every candidate is perceived by the electorate as being flawed, but Newt Gingrich is the one whose silver tongue is impressive enough to overcome his imperfections and win over the Republican Party. 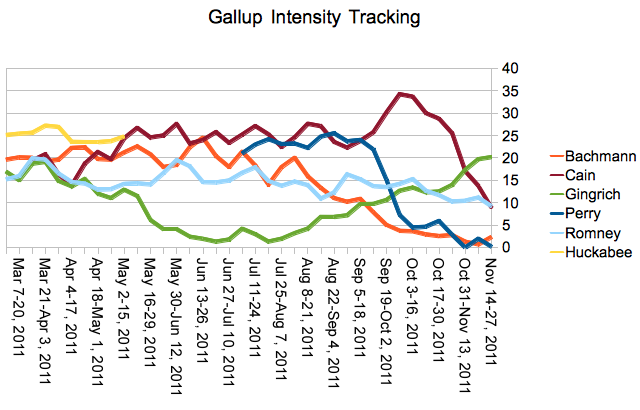 When I first checked the latest intensity score result, I thought it looked bad for Gingrich. Gingrich +20 and no other candidate in double figures (Romney and Cain tied for second at +9) just didn’t look like a sustainable lead. Gingrich looked like an outlier. But 88% of the party knows who he is. Contrast with September 4, when Perry led the national preference polling and the positive intensity polling, with Cain in second. At 74 percent, one in four didn’t know who Perry was. Cain’s 48% meant half the party didn’t recognize him. The only Republican better known right now than Gingrich, though, is Mitt Romney at 90%. A candidate that well known, who’s seen a slow, gradual climb in his positive intensity, isn’t due for a shock at being introduced to the party. It’s not what I expected to write, but I think Newt Gingrich might be the default Republican candidate in 2012, the one the voters are turning to when all else have failed.